Birthdays are a time to celebrate life with family and friends. It’s a time to plan that perfect party, invite the guests and eat plenty of birthday cake. 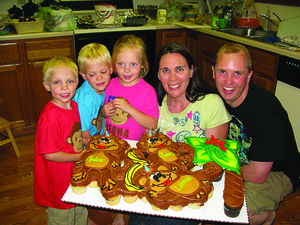 For some, planning a party for one child can be stressful enough. Imagine having multiples to plan for. Whether you have twins, triplets, or even more, we found out, it all comes down to what works for your family. Imagine celebrating for not one, or two children, but THREE at the same time. This has been the reality for Julie and Doug Prairie for the last 10 years. 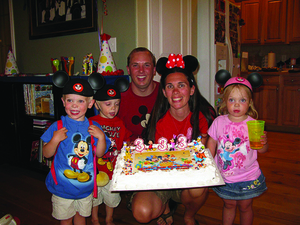 While they’ve had some time to get used to life with three children of the same age, it all started as a huge surprise. The kids, Sam, Leona and Gabe, had some scary moments during their first few months in the NICU and the first moments at home were a blur. 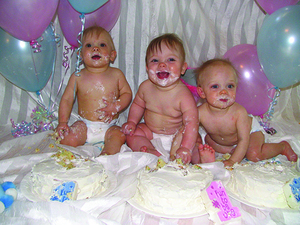 The Prairie’s didn’t have to think hard about how to celebrate their first birthday. And the parties haven’t stopped since. Julie has told the kids, no more big parties, but they just keep planning. From pirates to super heroes, they’ve mastered many themes over the past 10 years. Julie and Doug find a way to make it work, but always remember what’s important.